Prime Minister Ahmet Davutoğlu said on Tuesday that the PKK terrorist organization's offshoot, TAK, claiming responsibility of the Ankara bombing aimed to divert attention from the YPG, and the YPG militia was taking orders from the PKK. 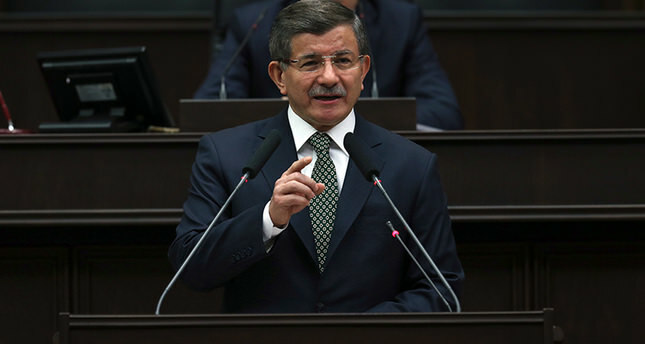 Speaking at the weekly AK Party group meeting at the Grand National Assembly of Turkey (TBMM) in Ankara, Davutoglu said the Kurdistan Freedom Hawks (TAK)'s claiming responsibility for last week's bombing was an attempt to exonerate the YPG. TAK is considered a terrorist group with links to the PKK. The groups worked together in carrying out the bombing which killed 28 people last week in Ankara, Davutoğlu said. Some media outlets claimed that the Ankara bomber was not YPG-linked Syrian national named Saleh Nejar as the government said, but a Turkish national named Abdülbaki Sönmez (Zınar Reperin), a member of a shadowy group known as TAK, a splinter from the PKK. The media outlets based their claims on the TAK's website, which posted Sönmez's picture along with a few lines about his life. Davutoğlu however clarified these allegations, saying these were attempts to "exonerate" the YPG and the picture posted on the TAK's website was not the suicide bomber, but instead it was a "montage" belonging to someone else. "The actions of the YPG which receives instructions from the YPG are in the open…The PKK and PYD are the same, these are pawn organizations. Turkey will not watch what is happening on its southern border as a spectator," the premier said. "We will uncover the actors behind this dirty play. And we will continue to punish the pawn in the appropriate manner." Davutoğlu also touched upon recent news of refugee harassment coming from Europe. He said Europe has also failed in its first year in welcoming refugees to their countries, whereas Turkey has been accommodating them with "an open heart" for the last five years.